The daffodils are nearly ready to bloom. These sprouted right through the snow, and their tips have been nipped by several hard freezes. In years past I worried that they wouldn’t bloom, that the damage would be so severe that they might wither and die away. Silly me. 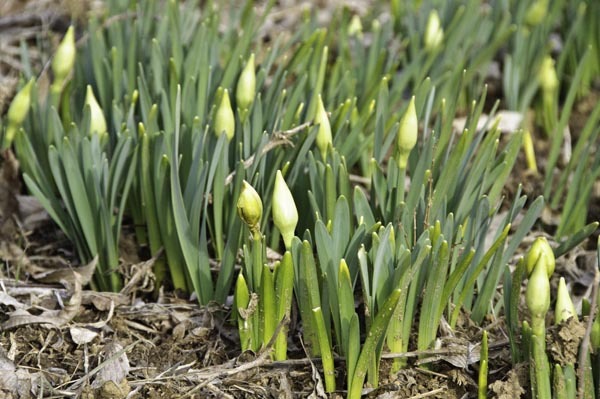 Daffodils are tough, and these old heirloom types seem indestructible. Some of the buds are already beginning to open. 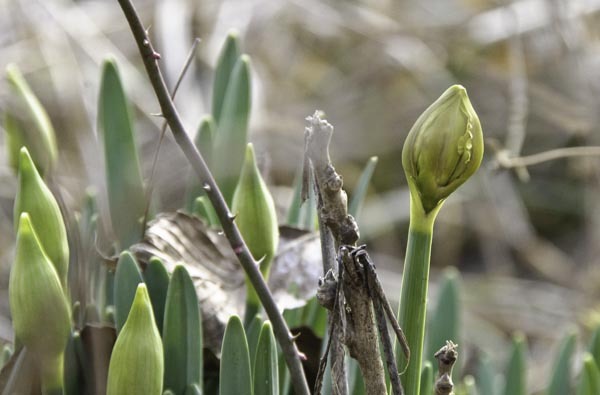 You can see bits of ruffled petal edges in the bud pictured above. Not so clearly pictured are the tiny leaf buds on the stem of the wild rose close by. Those buds have taken on a pink tinge and are beginning to swell. I expect tiny leaves will appear in the next week or so unless the weather turns bitterly cold again and freezes them. That could happen, of course. It’s still February, after all, and we’ve March to get through yet. I’ve written about this patch of daffodils before, in 2008 here and again in 2009, here.